I just love seeing a nice leopard-print carpet in a rather traditional home. Its a reminder that animal print is a classic and can be mixed in with most styles. I love that foyer! I can't wait to see what you go with. I think those spots would look phenomenal with that peacock blue you've got going on. I think that some animal prints can really be used as a neutral -- I have a friend whose entire house was carpeted in cheetah-print and it really worked with tons of different colors and styles! Gorgeous! I can't tell you how much I adore this house. Animal print is the perfect spicy neutral. ps - My favorite animal print is the Stark Antelope carpet. Swoon. Love the pattern! Can't wait to see in your home. Love it! Are you going to go for it? Just goes to show that classic lines have animal magnetism. Love your new look. Did you do this yourself, the new layout? I need help to make my images larger. Hi. New to your lovely blog. I adore animal prints as well, and even have that image stored somewhere in my laptop! thanks for your tips - have to make the box bigger for a larger photo. so another project! that's gorgeous. i think i would smile every morning when i came down those stairs. Love that entry!! And your new blog design is fabulous!! I am loving the blog design. It looks great. The small changes made a huge difference. I just practically jumped out of my seat-- there are so many elements to this image that I love. How I wish that I had the skill to put patterns together so well. Love the black and white tile and the ginger jars-- pretty much everything! I love the leopared-print carpet, its so unexpected...but it fits right in! What a gorgeous entry! 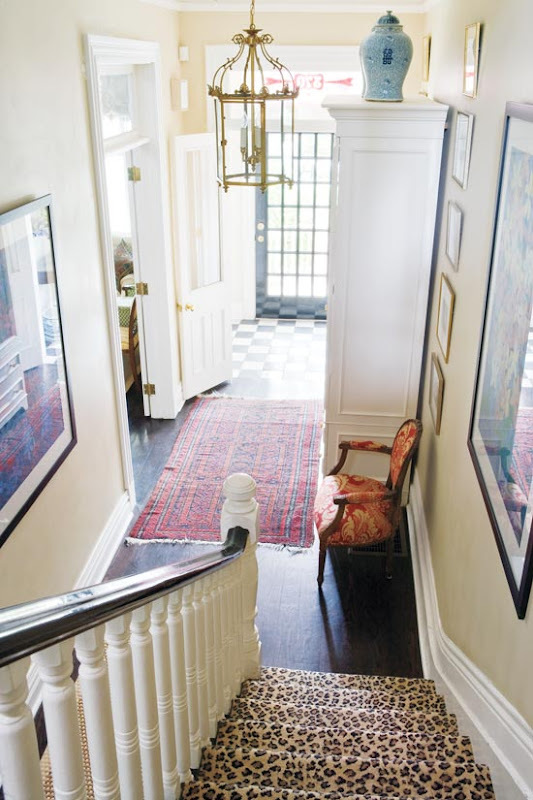 I'm always a fan of animal prints (in moderation) and it looks great as a stair runner here. Love you new blog design too!